Warm weather is here and it’s a great time to declutter and reassess what should go in and out of storage! 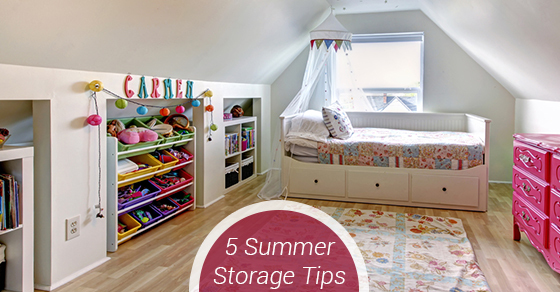 Here are some helpful storage tips to keep your home and storage unit organized as we get into the warmer months. Take stock of what you’re currently storing at home and what you have in your storage unit. For instance, holiday decorations and toboggans can head to the storage unit over the summer, while it’s definitely time to break out the patio furniture and the camping equipment! Make lists of items to go into storage and items to take out of storage to keep yourself organized and avoid clutter. Make sure when packing and unpacking your storage unit you are keeping it organized by stacking things strategically and neatly and labelling everything clearly. Store in plastic, not cardboard. While many may be tempted to reuse old cardboard boxes for storage, plastic will keep your items safe by keeping out pests and humidity. While plastic bins are more expensive than recycled cardboard boxes, it’s worth it to keep your belongings safe, especially if you live in a humid climate. Time to take care of the lawn! Common items that come out of storage units in the summer are gardening and landscaping tools, including lawn mowers. However, it’s very important not to keep any harmful chemicals in your storage unit, including propane, weed killer and gasoline. Excessive humidity can lead to mold, mildew and other moisture damage such as warping of wood and metal. Items like paper documents, fine art, clothing, anything made of wood and electronics need special care during the summer months. Keep these items safe from moisture damage all year round by renting a climate controlled unit. Climate control will keep your items safe from humidity and temperature swings, which can happen at the beginning and end of the summer. You may be thrilled your kid is home from university, but not so thrilled about the extra clutter! If your child attends university in another town, consider renting a storage unit to be shared between them and their housemates. This way they can store their furniture there over the summer and save you labour and moving expenses.